A month or so ago I discovered a figure drawing class in town. I’ve posted some paintings from a male model session here. It’s kind of not my thing and at the same time it’s such a marvelous challenge. I’m using it as a playground for trying different media. This second time I attended, there was a lovely young woman who wore a thick woolen hairband, which I just loved…as it so clearly depicted the tilt of her head in each pose. An advantage for me who has never studied anatomy in-depth. I used ink and a stick or bamboo pen this time, and grabbed a few diff colored inks as I ran out the door. Most folks there use dry media, something I have never gotten used to nor was ever trained in. I like my media wet and sloppy! The only “problem” with my using wet media is that because I paint quite quickly, I was constantly ripping pages out of my sketchbook and making a larger and larger mote of wet paintings on the floor all around me. I have to admit I was kind of embarrassed but it is what it is. When I went home though, a lot of that blobby ink was still not dry which posed a problem and a couple of my fave pieces of the night smeared a bunch. 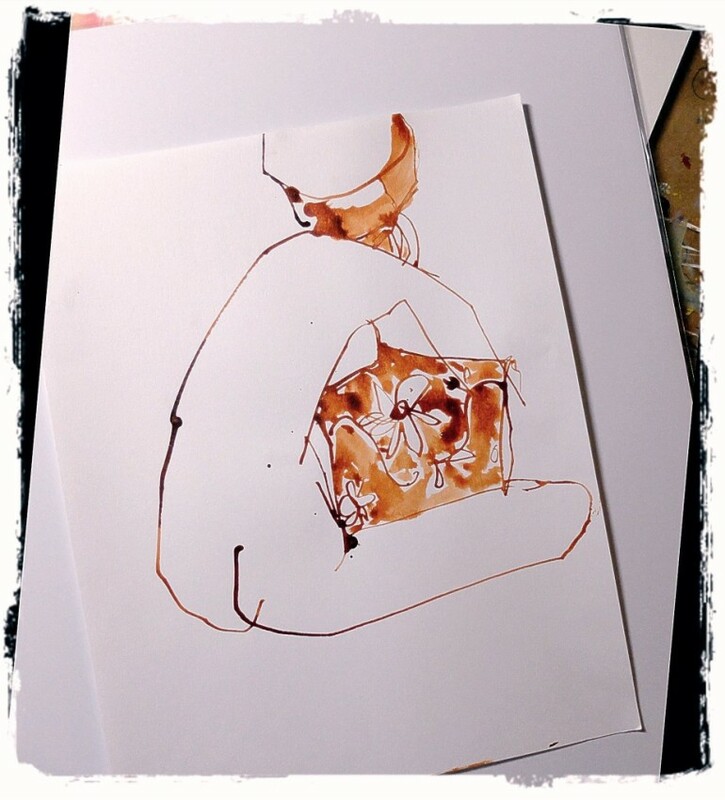 Nonetheless, I’m taking my ink again, sloppy or not, wet and smearing, messy and all! I love it! I downloaded a cool new program onto my Surface Pro 3 called Fhotoroom, and edited these pics in there. Thus the cool grungy frames. I love playing with photo editing software especially now that I’ve said au revoir to Photoshop!!! 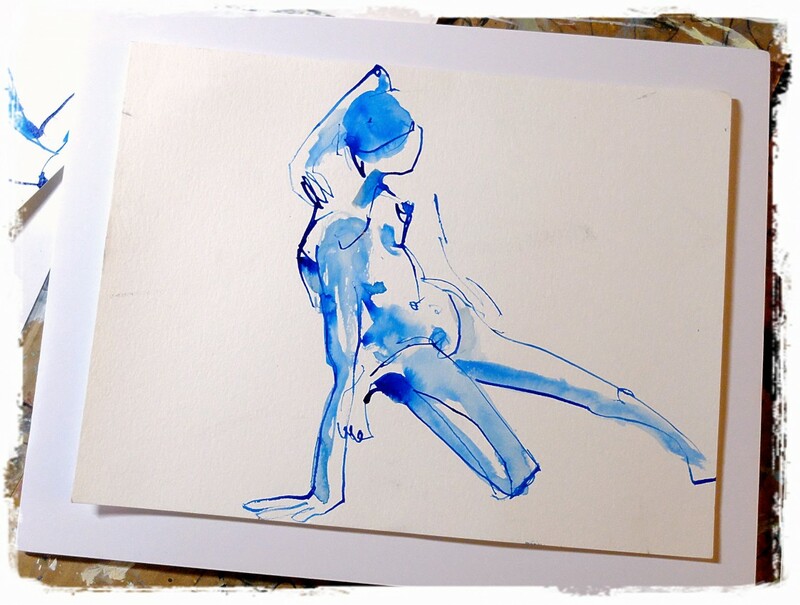 a 2 minute pose…see those brush strokes on the paper? that’s from the thick coat of gesso I used to cover the previous sessions “bad” sketches. waste not – want not! these two on a page are one of the first drawings i did, in the 2 minute pose phase. The first few are usually quite awkward, and then one eventually finds the lines. i like the expressiveness of these. a couple of 5 minute poses, egad, i love ink! i did take a scruffy asian brush and my water bin with me to pull out some ink here and there. my absolute favorite sketch of the nite, minimal in line and embellishment. though i did choose to fill in the pillow. i leave the class after two hours (it goes for three) because i lovelovelove the many short poses, as longer poses i tend to overwork. (and i’m a homebody! LOL) we each have an innate “pace” at which we do our best work, listen to that, explore that, and discover your “pace.” this one will be matted and framed for sure.